To wind up Women’s History Month, I’ve brought you a work of art from women who are largely ignored by art history books: weavers. Weaving is an ancient tradition, especially among First Nation cultures. In the 1970s the Feminist art movement reinvigorated art forms traditionally attributed to women and elevated them to fine art. The Pattern and Decoration movement, including artists such as Joyce Kozloff, was one result of that. I think it’s high time that art works from the “decorative arts” (a term I loathe) be included in the pantheon of art history. Maybe I’m biased because the Davis Art Gallery is sending out a call for fiber artists for our next show??? According to tradition, Navajo women learned weaving skills from two spirit beings: Spider Woman and Spider Man. Navajo women actually learned weaving from Pueblo males in New Mexico. In Pueblo cultures men were the weavers. Pueblo cultures raised cotton and wove blankets since about 700 ce. In the seventeenth century, the Spanish introduced sheep to Pueblo cultures, and wool was added to Pueblo weaving. 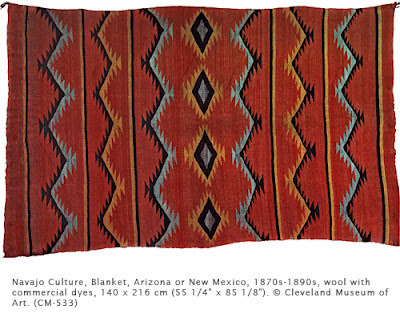 After learning how to weave, Navajo women quickly developed a distinctive style of their own. The Navajo wove blankets mainly for use as clothing, although “blankets” were also used as covers for doors and room dividers. It was after starting to trade blankets with whites that they began to create larger weavings that could be used as rugs rather than for wearing. Fragments of weavings from the late eighteenth century found in Canyon del Monte, New Mexico, are the earliest existing examples in the US of naturally colored, handspun wools with stripe patterns. In the 1860s commercial dyes were introduced from Germantown, Pennsylvania. By 1870, weaving was no longer used primarily as clothing but for trade. This blanket has a common zigzag pattern alternating with stripes. The pattern was meant to complement the curves of the human form when worn. The natural black wool contrasts with the brightness of the imported red and indigo. The jagged edges of the zigzag are taken from a pattern that symbolized clouds, an element of nature that represented change. The colors are also symbolic: red and yellow are synonymous with the sun and its nurturing warmth, black is the symbol of hope and joy, and blue symbolizes the sky. To this day, about 5000 Navajo women continue to weave rugs and blankets. Activity: Weaving on a cardboard loom. Using a piece of cardboard approximately 11 x 8 1/2,” cut slits in the top and bottom 1/2 inch apart. Take yarn and wrap warp abound the cardboard securing it in the slits. Weave another yarn over and under the warp, changing the order with each row. Use a fork to pull each row of weft tight against each other.